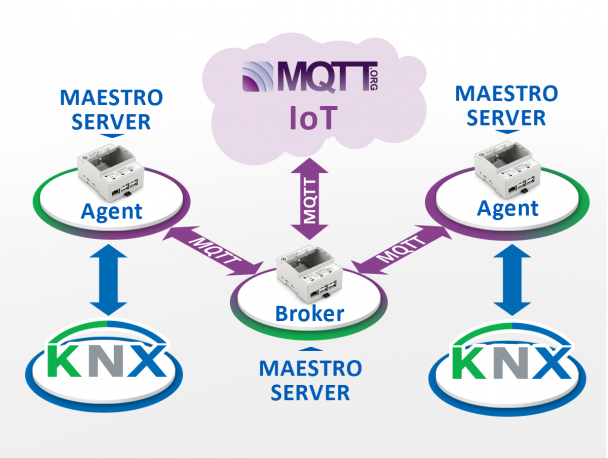 We are proud to announce that Maestro KNX Server now supports the well-known lightweight IoT MQTT protocol for Internet communication. The IoT world has been more and more prominent in our daily life with the MQTT to become the protocol of choice for it. So no wonder that renowned commercial platforms like Facebook Messenger, Amazon Web Services and Microsoft Azure decided using this Internet protocol for their WEB Services. Maestro can play any roll within the MQTT architecture: Broker, Agent (Publish and/or Subscribe) or even all at the same time. – Connecting any number of remote KNX sites over IP and sharing data between them. – Connecting KNX to SCADA and big-data software for further processing and integration with external systems. Moreover; Maestro can serve as a powerful central controller for MQTT components wherever they are, harnessing all Maestro’s capabilities to the process such as: data collection and graphs presentation, scheduling and advanced logic settings, artificial intelligence for data processing etc’. These capabilities enable to securely retain the information at the user’s local site and to choose if and what to be sent for processing on third party’s cloud platform and what to retain in privacy and processed locally. MQTT – Originally developed by IBM is an, event driven, lightweight protocol, ideal for IoT (Internet of Things) contexts. Used for single miniature sensors up to gigantic systems as Face Book and Amazon for their WEB services. With this latest support of MQTT CD Innovation strengthens its presence in the IoT world providing the home and building automation professional channels with Internet access to KNX via the IoT most popular protocol keeping Maestro in the forefront technology.